Cleavers resemble hand axes in that they are large and oblong or U-shaped tools meant to be held in the hand. 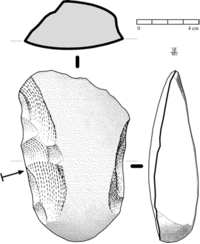 But, unlike hand axes, they have a wide, straight cutting edge running at right angles to the axis of the tool. Outside Africa where cleavers were most abundant, cleavers have appeared in Southwestern Europe. In these regions, they are more abundant than hand axes where raw material occurs in the form of large quartzite cobbles that do not need extensive decortication and shaping prior to the removal of large flakes. Cleavers can also be found made out of different raw materials such as flint or limestone, but these are not nearly as common. Wikimedia Commons has media related to Cleavers (archaeology).